Father | "SAY WHAT LENA!!!???" Greenwood is a neighborhood in Tulsa, Oklahoma. 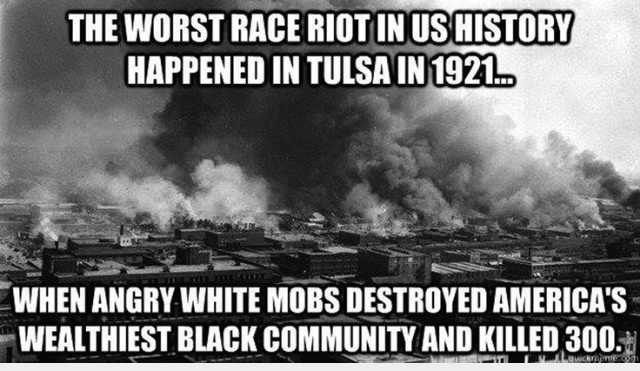 As one of the most successful and wealthiest black communities in the United States during the early 20th Century, it was popularly known as America’s “Black Wall Street” until the Tulsa race riot of 1921, in which white residents massacred black residents and razed the neighborhood within hours. The riot was one of the most devastating massacres in the history of U.S. race relations, destroying the once thriving Greenwood community. Within five years after the massacre, surviving residents who chose to remain in Tulsa rebuilt much of the district. They accomplished this despite the opposition of many white Tulsa political and business leaders and punitive rezoning laws enacted to prevent reconstruction. It resumed being a vital black community until segregation was overturned by the Federal Government during the 1950s and 1960s. Desegregation encouraged blacks to live and shop elsewhere in the city, causing Greenwood to lose much of its original vitality. Since then, city leaders have attempted to encourage other economic development activity nearby. Florida woman – who had been serving a 20-year sentence for firing what she described as a warning shot at her abusive husband – was released from jail Wednesday night, according to a report from First Coast News. Her bond was set at $200,009. Although no one was injured in the incident, a jury convicted Alexander of multiple counts of aggravated assault with a firearm in 2012, requiring a 20 year sentence thanks to Florida’s “10-20-Life” law, which sets mandatory minimum sentences for crimes committed with a gun. Her conviction was overturned in September when a judge ordered a retrial after finding that the jury instructions in her original trial were erroneous and had unfairly put the burden on Alexander to prove that she had fired her shot in self-defense. Alexander has spent more than 1,000 days behind bars, according to her lawyers’ count, keeping her away from her youngest child for most of the first three years of her life. The organizers behind the Free Marissa Now Mobilization Campaign cheered her release in a statement Thursday on the group’s Facebook page. Mother Drowns Three Children and Gives Birth while Incarcerated!!!??? A Long Island mom who admitted to drowning her three children has given birth to a fourth while incarcerated. NBC New York reports that Leatrice Brewer, 33, was impregnated at the Mid-Hudson Forensic Psychiatric Center in New Hampton where she’s been locked up since admitting to drowning her three kids in a bathtub in 2008. The center refused to comment, citing privacy laws, and it remains unclear who the father of Brewer’s child is or how she was able to get pregnant at the secure facility, according to NBC New York. Attorney Tom Foley, who represents the father of two of Brewer’s deceased children, called her pregnancy “outrageous”. The Associated Press reported last week that Brewer, who was found not guilty by reason of mental disease or defect, is also seeking a cut of $350,000 won by the fathers of her children in wrongful death lawsuits. Psychiatrists who evaluated Brewer said she had a major depressive disorder and likely killed her children because she wanted to save them from the deadly effects of voodoo, according to the AP. Shortly after she killed her children, Brewer attempted suicide, first by swallowing a combination of cleaning products and then by jumping out of a two-story window. Dad Pushes Daughters Stroller into Traffic!!!??? Israel Drops Bombs on Gaza!!!?? ?